Click here for high-res image, courtesy of Pantone. Top Trending Colors for Spring 2018! Each season, the Pantone Color Institute releases an overview of the top colors for the upcoming season. Color continues to be an important influencer of consumer trends in Spring 2018. In response to consumers continued embrace of color, product designers and manufacturers are recognizing the need to offer more color variety in their products. Here at JEG Inc., we see increased demand for Pantone’s top colors every season. We can create these colors to work with any resin system and with any molding process. Spring 2018’s colors offer a bounty of uplifting shades and feel-good tones, including Meadowlark (13-0646), Cherry Tomato (17-1563), Little Boy Blue (16-4132), Chili Oil (18-1440), Pink Lavender (14-3207), Blooming Dahlia (15-1520), Arcadia (16-5533), Ultra Violet (18-3838), Emperador (18-1028), Almost Mauve (12-2103), Spring Crocus (17-3020), and Lime Punch (13-0550). 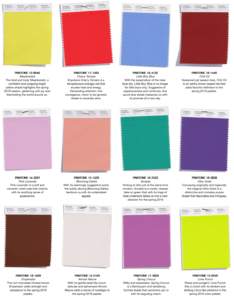 Contact the colorant experts at JEG Inc. at 614-882-1295 today for a color consultation and free color sample to find out how you can incorporate these colors into your products.